दा विंक्स क्लब Who is that character? Here's the deal, we'll each take turns giving out riddles, and the rest of us will guess what character the riddle is talking about. Ex: 1st Person: My name reflects my power. I am a villain. My polar opposite is Bloom. Who am I? And so on and so forth. I hope you enjoy! I am from earth. I first appeared in Season 4. I attend Alfea. I am the fairy of animals. Who am I? I am a princess. My powers are morphix and waves. My bonded pixie is a baby. I am a fairy. I am a bit grouchy. I am a specialist. I once was in love with one of The Trix. Who am I? I am very cheerful and I get excited quite a lot. I am a pixie. My bonded fairy is very sweet. I have pigtails. I am a fairy. I have red hair,and I am a princess . I have a sister. Who am I? My mom died when I was young. I used to have short hair, but now I have long hair. I am a fairy. I have bonded with two pixies. I used to be cursed by the Siernix curse, but my sister broke it with her Sirenix wish. Who am I? I am a fairy. I have short purple hair and not much is known about my family. I have bonded with two pixies. I am the smartest fairy in my group of friends. I am a fairy. There has been confusion if I am royalty or not. I bonded pixie is very talkative. I have a little sister but besides her not much is known about my family. My name starts with S. I'm a fairy. My hair is blonde. My boyfriend switched places with his best friend. Who am I? I am a selkie. I like to decorate everything with flowers.Who am I? 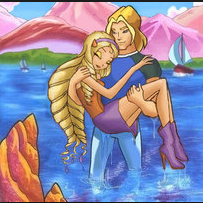 I was Stella's Messenger telling her about her dad and what was going on in Solaria. I am also a friend but not apart of the winx. Who am I? im a girl ho attend alfea and i have healing power, im helia 's old friend, who am i? I am a witch and a member of Trix.I also referred to as "Lady of Darkness".Who am i? im one of the specialist, i have brown and short hair who am i? I am the leader of the Trix. I have two sisters. I have powers over ice. Who am I? I hate Bloom. I love myself. I was voiced by Arianna Grande during Season 3-Season 5. I love Sky. I'm his REAL FIANCEE.